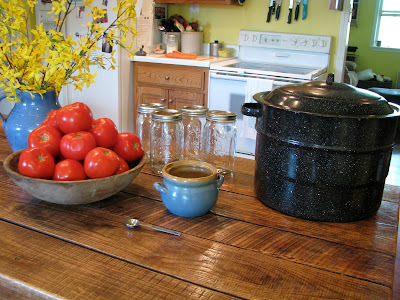 Canning tomatoes was one of my first solo canning projects. It is fun and simple and having tomatoes on the shelf is such a great thing. You can use them in so many venues. Chili, spaghetti, stew, pizza sauce and the list goes on and on. Most people, at least most people I know that garden like we do, put up a good amount of tomatoes. In various forms. I like to put them up in quarters. That way, I can turn them into anything that I would like. If I need them big, I don't have to do anything, but if I need puree, a quick trip through the blender and I'm set. You need a few basics for this project. Once you have all your supplies gathered. Get a good amount of water in your canner and get it HOT! Also, put another small pan on the stove and get the water hot too. You want to blanch your tomatoes, It helps the skin slip right off. One more thing. Get a bowl with ice water. After dropping the tomatoes one by one in the hot water, you want to leave them only about 30 seconds or so and then plunge them into ice water. This will help them not to cook. You don't want cooked tomatoes during this, just the skins to come off easily. Here I have my canner bubbling away, ready for the jars. I have my pot of hot water ready for blanching. I have my bowl of ice water for cooling. Take your tomato and cut an X across the top. This will help you get a start on the peeling of the skin once you finish blanching. Tomatoes go into the hot water, do only one or two at a time, unless you have helpers in the kitchen. Once you see the skin starting to pull away slightly dip them out and put into ice bath. Like I said, it should only take about 30 seconds or so, but depending on the temperature of your water, it can vary one way to another. Once slightly cooled in the ice bath you can remove and peel. The skin should slide off easily, core the tomato also during this time. After you peel and core the tomato, cut it into quarters and drop into a bowl. 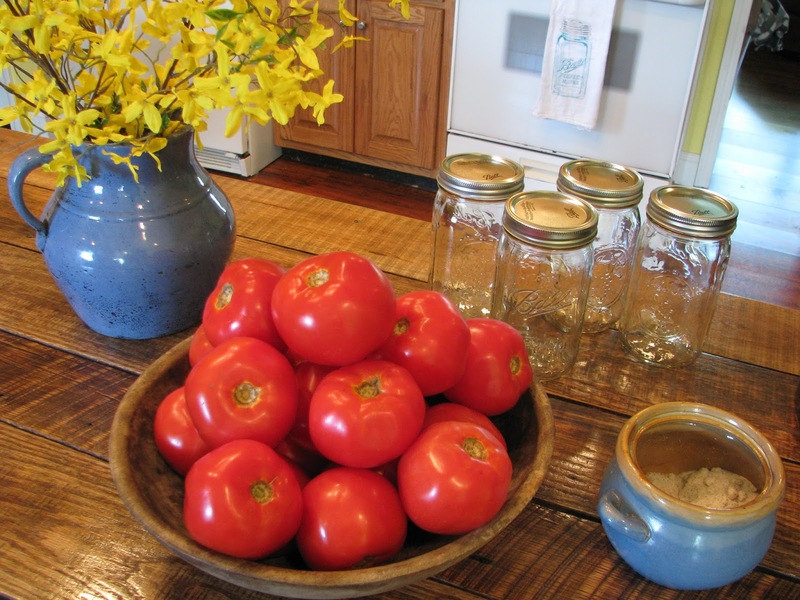 After all your tomatoes are blanched, peeled, cored and quartered... it's time to pack your jars. You may have some juice in the bottom of your bowl. Add that to yours jars as well. Pack your jars full, but don't compact them. Add a teaspoon of salt to the top of the jar. Now pour HOT water into your jars and attach your flat and ring. Lower ready jars into your canner and process for approximately 20 minutes. If you go for TOO long, you will cook the tomatoes into nothing. I like a bit of firmness left in my tomato. So I only process long enough to get a good seal and slightly cooked tomatoes. Once you are finished, put canned tomatoes on a towel and leave until they are completely cooled. Usually a good 10 hours. During that time, you should get a seal on your jars. Now line your shelves with the bounty. The beautiful red ripeness of summer in a jar. You CAN can tomatoes! I hope you enjoy and let me know once you have canned your own. I would love to hear from you. Thanks for the tutorial. Those tomatoes look beautiful! Your tomatoes look perfect. We do ours the same way. I also do some up and freeze them in vacuum seal bags.